Find your meat grinder parts at Nelson Appliance. 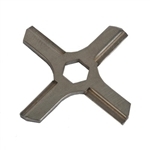 We provide cutter blades, grinding plates and retaining nuts. Krups threaded aluminum retainer nut for food grinder models. This retaining ring fits Moulinex and Regal meat grinder models as well. Krups Stainless Steel cutter blade for food grinder models. This cutting blade fits Moulinex and Regal meat grinder models as well.